I’ve decided to do a project exploring fiber content and construction techniques for socks. At the rate I knit it could be a lifetime project! For my first project …. Used FLK (Fish Lip Kiss) pattern for sizing and heel. Since it’s my first time using this pattern I used plain knitting for the body of the sock. This is only the second pair of socks I’ve ever knitted. I want to work up to Magic Loop for both socks at one time but this pair was done on two circulars, and I did an inch on one sock then an inch on the other sock in order to avoid the dreaded SSS (single sock syndrome). It worked! This variation used Wooly Yarn (nylon wool blend, see Halycon yarn for example) held doubled with my yarn in the heel, and the next one will use 100% mohair for the heel. The yarn used was Rambler’s Way Handpaint Rambouillet DK (100% American wool and spinning) which is spun with a high twist. Loved the yarn! It is super springy and knits soooo easily. I had to watch out for splitting the yarn (my knitting Achilles heel) and accidentally creating yarn overs when increasing. I used Turkish Cast On (my 1st time – love it!) and kept each sock separate (on it’s own set of circulars). The Woolly Yarn used for the heels was hard to use as it kept sticking to my fingers and I split the yarn frequently – luckily I didn’t have to do any frogging!. It took about 40 hours of knitting for the pair. They fit fairly well initially but stretched lengthwise while wearing. Due to the size of the yarn they don’t fit in regular shoes but are fine in boots or slippers. I was surprised to find I did not like the feel of the purl bumps on my feet so am wearing them inside out with the knit side facing in. So far they are holding up well. 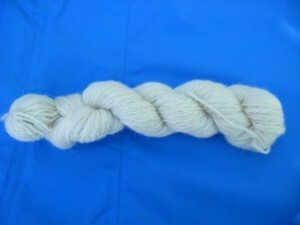 High twist is needed for 100% wool yarn to wear well, particularly low micron wools such as merino, rambouillet, cormo, etc. 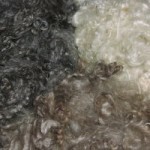 I use 25-50% mohair in all my own yarn blends to ensure good wear performance. Size (weight) of yarn impacts which shoes the socks will fit into. Soft springy 100% yarn will stretch significantly so this needs to be taken into account for sizing. Next….Same pattern, same wool, two at a time (TAAT), 100% mohair heels – thinking about a stitch pattern for foot and leg. 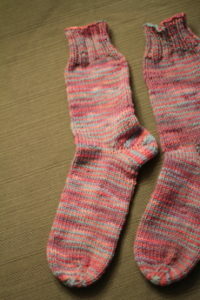 See Sock Knitting Exploration Version 2. 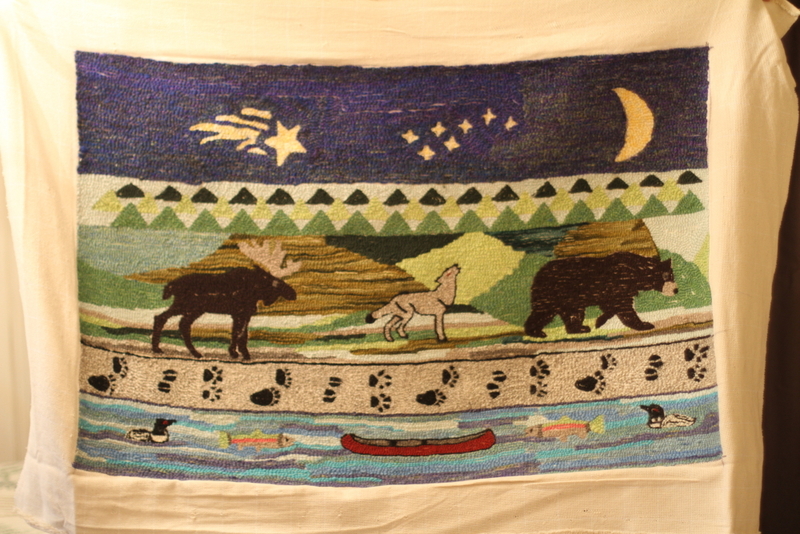 I was commissioned to hook a 2′ by 3′ rug for the Short Family in Maine as a Christmas gift. 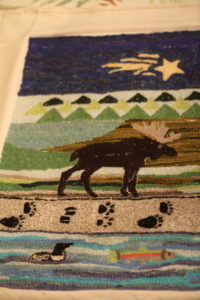 I used my homespun and millspun hand dyed yarns, all of which are wool/ mohair blends as much as possible but due to the short timeline for producing this rug I also used purchased yarns (details). Even so I had to spin an extra 2 skeins of Starry Nights yarn for the night sky…can’t imagine how long it would have taken to dye and spin all the yarn colors needed for this size rug! The backing is 100% cotton 13×13 epi Monk’s Cloth. The design was created based on royalty free clipart and photos, then enlarged using Ronyasoft Poster Printer. The Short family lives on a lake (or pond as they are called in Maine) which has loons and they often have bear, coyote and moose visitors near the house. Additionally one of the family members worked at a state fishery for many years raising rainbow trout. The rug was designed as a unique reflection of the Short Family. 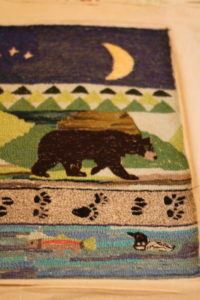 Even at this large scale details such as eyes and color markings on the loon did not show as well as I would have liked but the use of finer yarns than in other parts of the rug helped. 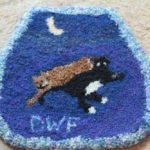 The paw prints took a long time because of the many color changes needed and because I used finer yarn to get better detail. For the coyote I used a tweed (white and grey) yarn to better mimic the color variations in their natural coats. Working the lines of color around the animal outlines is an area I will work to improve on future projects. I found it easier to get the shapes to hold true if I hooked the objects then worked the colors directly around them while holding back the yarn that formed the outside of the object from underneath. Horizontal lines of varying color produced a nice impression of moving water. This chair seat is called “Rori Shows Her Belly” and shows Rori on a rug in a typical “scratch my belly” pose. The design is based on one of my photos of her. I used my homespun and millspun hand dyed yarns, all of which are wool/ mohair blends (details). The backing is 100% cotton 13×13 epi Monk’s Cloth. 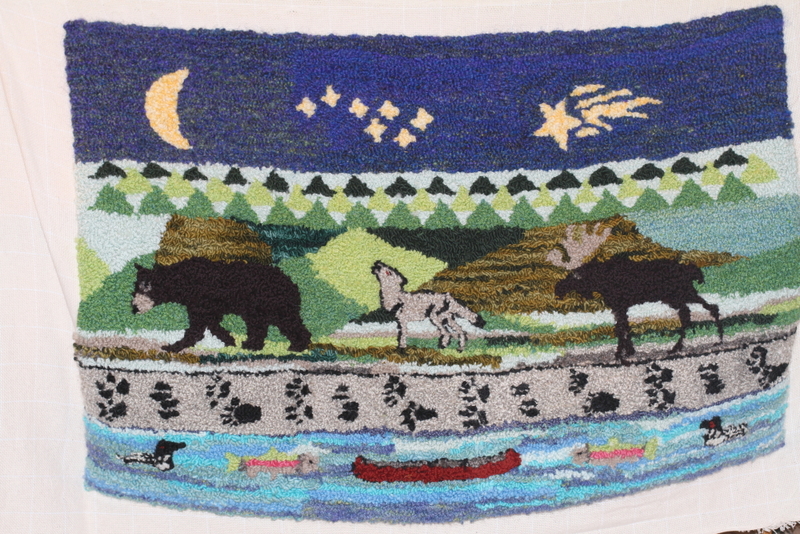 The rug Rori is laying on is made of 4 different green millspun yarns. Details came out better with the more enlarged size of the cat. Also, contrast is key to making small details visible. The 13×13 epi Monk’s cloth worked much better than the looser version designed for embroidery. Rug: Pearl Green kettle hand dyed (before carding) millspun. Forest Dreams hand dyed (before carding) millspun. Designed to look like a forest at a distance for use in weaving and rug hooking. Aquatics hand dyed (before carding) millspun. Designed to look like pond water for use in weaving and rug hooking. Green with Envy hand dyed (before carding) millspun. 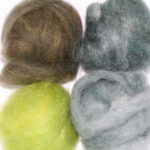 Rori: Since natural black isn’t readily available in mohair (black mohair is dark grey at best) I bought a skein of Brown Sheep’s Lamb’s Pride Worsted Onyx from Alpaca Direct as they had the best price when I was shopping. 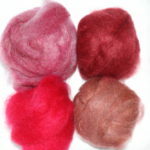 It is a USA made 15% mohair/ 85% wool single ply yarn. I also used mill spun natural DWF white mohair/ wool yarn for Rori’s tummy patches. Sport White Millspun 2 Ply 59% Mohair 31% Shetland Wool. Eyes: Coreopsis hand dyed (after spinning) millspun. This yarn is shades of yellow with sections of yellow and white designed to stripe. I used a small amount from a section of yellows. A small amount of Natural Dark Grey DK 2Ply Millspun 68% Mohair 32% Shetland, Blue Faced Leicester Wool was used to create depth around the chin line and between the toes. Lettering: Ooops! Forgot it on this one so embroidered on the back. This chair seat is called “Nap Time” and features Sandy and Rori napping against the night sky. The design is based on my photos of the two napping on my bed. 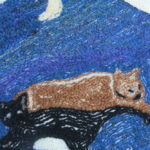 I’m experimenting with different colors and textures of yarn to find the best for picturing the cats. 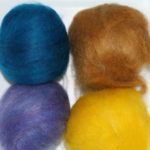 I used my homespun and millspun hand dyed yarns, all of which are wool/ mohair blends (details). The backing is 100% cotton Monk’s Cloth. I used 8×8 epi cloth since I’d already washed the fabric and drawn the design on this cloth found in my stash. The next chair seat will use the new 13 epi cloth I ordered as it is designed for rug hooking and should make the hooking go more quickly and efficiently. 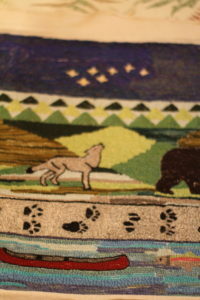 I designed Starry Nights roving with various blues, purple and black with bits of yellow to look like the night sky in weaving and rug hooking. This “rug” used a lot of it as I went with a fairly simple background so the one skein I had spun was not enough! Had to stop and spin another skein when I was nearly finished. Oh well, it means I’ll have some ready for another fiber project. “Nap Time” in progress. Moon, sky and part of Sandy shown. Starry Nights roving and 1 ply on bobbin. 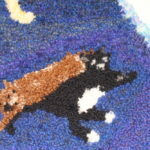 For this size “rug” (roughly 16″ x 14″), the subjects need to fill the space as much as possible for any detail to show and look right. I’m trying to find an easier way to enlarge my drawings than redrawing from scratch based on a grid. I looked at buying on overhead projector or enlarger but they are fairly expensive and my scanner/ copier doesn’t enlarge. Still working on this. Cats aren’t brown, but orange isn’t right either. 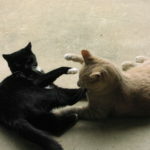 I may have to design a roving or yarn that will give me the greyed orange with cream stripes that says tiger cat to me. In the first chair seat I used tweed yarn and it gave a nice random tan and white color to the cat. In this one I used a hand spun with random brown and white color changes. The way the colors fell gave a stripe to Sandy’s back and mostly brown elsewhere. With some planning I could create stripes where they are wanted but it would take a bit of work. Black is also tough to re-create as mohair isn’t really black except in new born kids, it turns to grey, so it would have to be dyed to get that color. 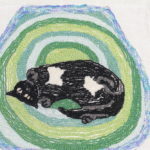 Additionally, shades of black would be needed to allow any details of the cat to be seen. 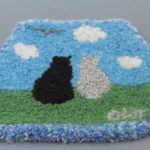 The size of the rug makes the addition of whiskers pointless – they would either not be visible or take up a disproportional amount of space versus the rest of the body. The eyes were an issue too because of their proper size in relation to the entire body. Since the smallest object that can be hooked is 3 punches with the needle, that fixes the eye size in relation to the rest of the design. In this case the eyes seem too big for the body. On to Chair Seat number 3! Sky: Starry Nights hand dyed (before carding) roving. 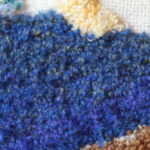 Designed to look like the night sky (variegated blues, purples, black and bits of yellow) for use in weaving and rug hooking. Moon: Coreopsis hand dyed (after spinning) millspun. This yarn is shades of yellow with sections of yellow and white designed to stripe. I used a small amount from a section of yellows. Cats: Brown and white random color hand spun skein from a (stash) roving grab bag for Sandy. Since natural black isn’t readily available in mohair, I bought a skein of Brown Sheep’s Lamb’s Pride Worsted Onyx from Alpaca Direct as they had the best price when I was shopping. It is a USA made 15% mohair/ 85% wool single ply yarn. 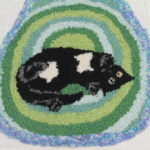 I used this yarn for the black cat (Rori). I also used a mall amount hand spun natural DWF white mohair/ wool yarn for Rori’s white paws and stomach patches. Sport White Millspun 2 Ply 59% Mohair 31% Shetland Wool. A small amount of Natural Dark Grey DK 2Ply Millspun 68% Mohair 32% Shetland, Blue Faced Leicester Wool was used to create depth in Rori, around the chin line and the inside of the ears. Lettering: A small amount of hand spun, turkey baster hand dyed roving (white with small amounts of orange and blue) was used. A ball of roving was soaked in water for an hour, then injected with colors using a turkey baster, heated to boiling for 30 minutes to set the colors, then washed before hand spinning.